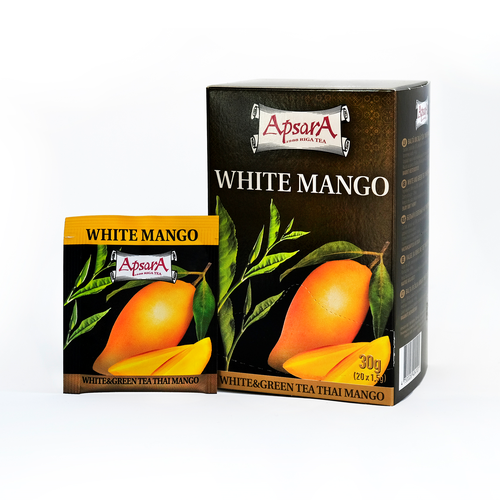 White and green flavoured tea „ White Mango”. Ingredients: Chinese white and green tea, blackberry leaves, flavour of mango and tropical fruit. Taste: refreshing with mild astringent note. Brewing instructions: Boil fresh water and cool till 85C. Use 1 teabag per 200ml of water. Recommended infusion time is 3-5 minutes. Features&recomendation with food: Gentle afternoon drink. Pastries, fruits and cakes. Product highligths: Original receipe of white and green tea with a hint of herbs. Modern and trendy for everymore, who does like to discover new tastes.